The world watched in horror over the past few days, weeks and months as Putin’s bombers destroyed Aleppo, intentionally targeting hospitals and schools, deliberately destroying a UN aid convoy, and indiscriminately killing men, women and children. Since the resumption of Russian and Syrian bombardment of Aleppo on November 15th, over 500 civilians have been killed. As you read this, tens of thousands more are fleeing from Russian jets, many bombed even as they seek escape. Now, even as these war crimes continue, the Russo-British Chamber of Commerce has decided it would be a good time to promote trade links with Russia with an event at The Queen Elizabeth II Conference Centre in the heart of Westminster. Theresa May said yesterday that ‘business as usual’ with Russia is not an option. The UK and the EU have already imposed some sanctions on the Putin regime for its illegal annexation of the Crimea, but businesses in the UK are still able to trade with Russia, and Russian banks still have access to the SWIFT international banking system. Current sanctions are not enough to deter Putin from aggressive acts against Ukraine, nor from his campaign to keep Syrian dictator Bashar al-Assad in power by destroying every vestige of popular democratic resistance to the regime. Putin claims to fight terrorism in Syria, but military observers have documented that hardly any Russian airstrikes actually target ISIS. Instead Putin’s target is those Syrian communities which reject Assad. The world has no legitimate business with a regime which is currently exterminating an entire city in order to keep a dictator in power. 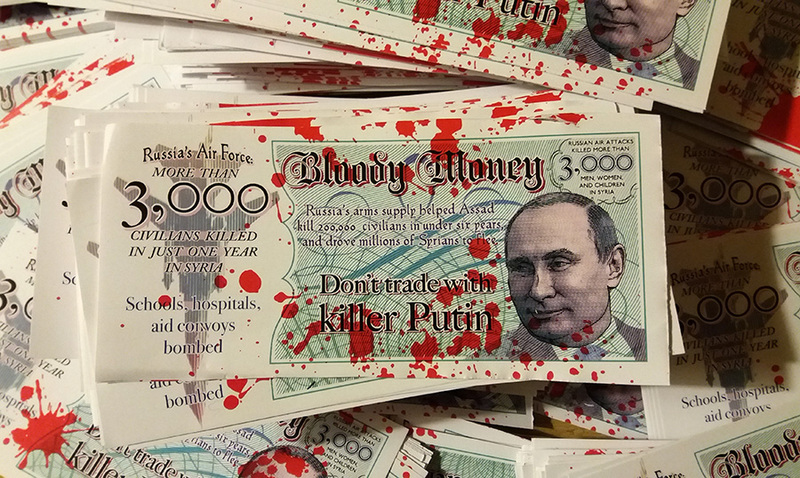 UK trade with Russia taints us all with the blood of Putin’s crimes. Putin’s and Assad’s war against the Syrian population has driven millions to flee, and has helped destabilise politics across Europe. Putin’s actions in Syria and Ukraine undermine the rule of law and threaten all our futures. The price of allowing Putin’s aggressions to continue is too high. 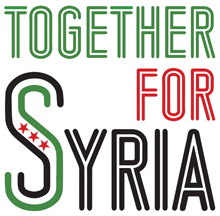 Freeze all trade with Russia until the Putin regime ceases its targeting of Syrian civilians. 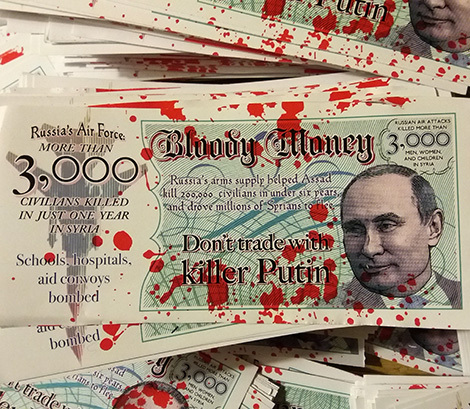 Demand that Russia is cut out of the SWIFT international banking system to make it much more difficult for Putin’s regime to do business abroad. Join the growing calls for a UN General Assembly emergency session to bypass the Russian UNSC veto on international measures to protect civilians in Syria. We urge the UK business community to think carefully; any company that continues to trade with Russia risks lasting damage through association with a regime guilty of ongoing crimes against humanity. We urge the UK Government to immediately impose a no-bombing zone on Aleppo and all opposition held areas of Syria. 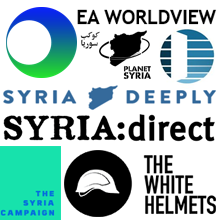 We urge the UK Government to carry out emergency aid drops to Aleppo and other besieged areas from its base in Adana, only 15 minutes flying time away. Break the starvation siege that Putin and Assad are imposing on hundreds of thousands of innocent people.